CGI Viral Video Ad - Heads or Tails? Coin Dealers: 3D Animated CGI Viral Video Ad – Heads or Tails? Web & Social Media Marketing Package with 3D Animated CGI Viral Video Ads – Heads or Tails? For only $499 we will custom brand this Heads or Tails CGI Viral Video Ad Social Media Marketing Package with your company logo and website URL. This is less than one tenth of the cost of creating such high end CGI animation. The Web & Social Media Marketing Package includes the full HD 30 Second CGI Viral Video Ad, A 20 Second version of the viral ad, A 10 Second version of the viral ad and two still poster images. All custom branded with your logo and web URL. Coin Dealers: It’s as easy as 1, 2, 3! Simply submit your order through the Buy Now button above. Email your logo to info@DreamLight.com. Vector PDF, EPS, SVG, AI preferred but large PNG or JPG OK. Please include a valid return email address and what URL you would like to use on the ad. After we receive your order and logo we will contact you with any questions. We will add your branding at the end of the ad in the lower right corner. 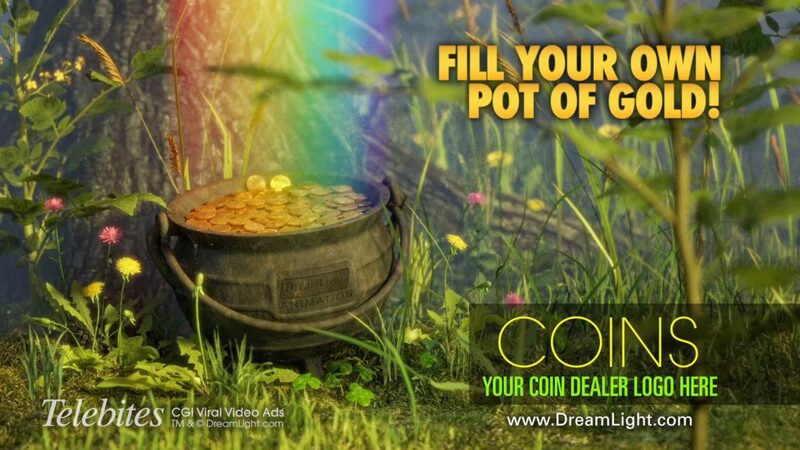 Your logo will be placed in the rectangle where it says “COINS your coin dealer logo here” and your web address will replace “www.DreamLight.com” below the rectangle. We will then provide a link where you may download the finished CGI viral video ad marketing package to use on your website and social media pages. Customization typically takes a couple business days to a week or so depending on our current project workload. Please check your spam folder and call us if you don’t receive an email reply within a couple business days. This Telebites CGI Viral Video Ad for Coin Dealers – Heads or Tails – is a metaphorical magic trick intended to capture the social media viewer’s attention and bring them to your website as a potential new customer. As they scroll through their social media feed, their attention is caught by the spinning coin and they are asked “Heads or Tails?” This piques their curiosity and builds anticipation toward an expected outcome. As soon as the coin comes to rest a faint rainbow shines on it and it surprisingly splits in two, tossing a new coin in the air which lands on top of the first. That coin then splits tossing a new coin in the air, which itself splits as two new coins fall down. As the rainbow grows and intensifies the raining coins become a torrent evoking the feeling of hitting the jackpot. The camera then pulls back surprisingly revealing that the scene has transformed into an outside serene scene of a pot of gold nestled under a tree at the end of a rainbow. Thus it tells the story that it doesn’t matter what type of coin you buy. All that matters is that you buy that first coin, and continue adding to your holdings over time. Then you’ll end up achieving peace of mind and financial security as if you had your own pot of gold at the end of a rainbow. This Telebites CGI Viral Video Ad is targeted at the typical social media user who generally has no idea about bullion vs. numismatic coins. So while numismatic coin dealers may wince at coins dropping on each other, the average social media viewer would be more excited by the idea of hitting the jackpot. The animation is intended to grab their attention in the middle of their social media feed and bring them to the coin dealers’ website as a potential new customer. If we were to create an ad to target existing coin customers who are more familiar with purchasing and handling coins we would take a somewhat different approach. We may create such a piece in the future if there is enough interest. Please let us know! If a picture is worth a thousand words, then a video is worth volumes. In order to take advantage of that potential worth however you need potential customers to see your video. Telebites™ brand 3D animated CGI viral video ads spread your marketing messages across the web and social media. These short focused videos grab your viewer’s attention and pique their interest. The videos build anticipation and suspense before surprising and amazing the viewers, much like watching a digital magic trick. This imprints your brand in your viewer’s mind with a positive emotion. Creating such custom 3D animated CGI content would normally be beyond the reach of typical small business budgets. Telebites brand 3D animated CGI viral video ads however are pre-designed and produced for specific industries. This allows us to offer custom branded versions of the CGI viral video ads for less than one tenth of the cost to produce such 3D CGI animation. This brings the cost to fit within the average small business marketing budget. We will custom brand the CGI viral video ad with your company logo and provide you with an HD1080p CGI viral video ad for use on your website and social media. DreamLight also creates custom 3D animated CGI viral video ads from scratch. 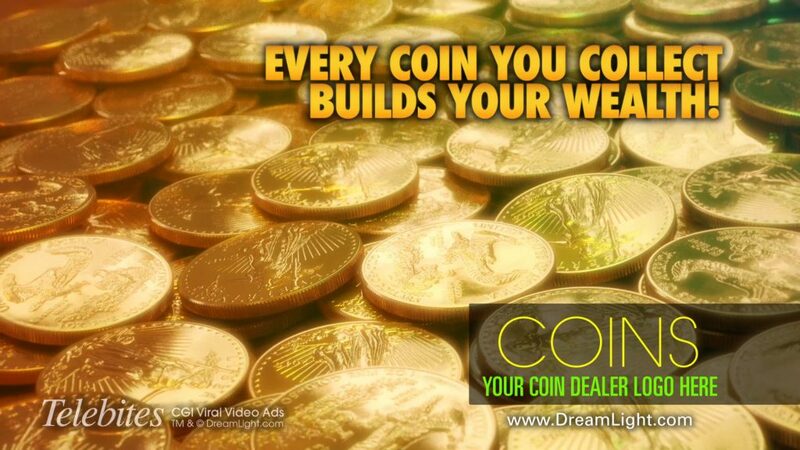 Whether you want to showcase your products or highlight their key features and benefits, DreamLight can work closely with your marketing and product teams for coin dealers and other businesses. We can create custom 3D animated viral videos with 3D special effects and 2D motion graphics. This will elevate your sales and marketing efforts to a whole new level. Don’t settle for using static photos or generic videos to market your products on social media. Rise above reality with custom 3D animated CGI viral video ads instead. We can even leverage such animation into larger and longer format animated content. This way we can target other uses such as trade show exhibits, online web sites, business presentations, TV or film.